What a whirlwind our 2019 has been so far! 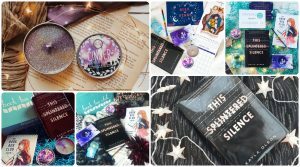 We are nearly three weeks in and Christmas feels like a distant memory; what with preparing and posting your January Storytellers boxes, revealing our plans for our February Magic Potions box, plotting lots of exciting items for future boxes, reading lots of incredible books for boxes later in the year (and working on less exciting finance spreadsheets!) our 2019 has started with a BANG! Now – in a last look back at 2018 – we’re going to kick of this weekend with an unboxing of our December RULE THE STARS box. So without further ado, bring on the unboxing! 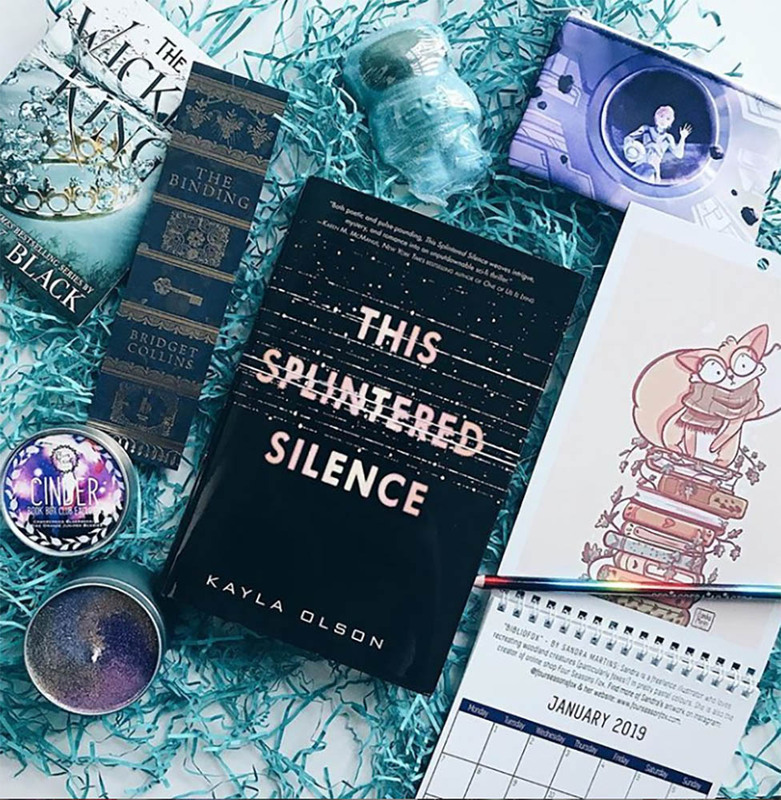 This Splintered Silence by Kayla Olson: Lusca Space Station is doomed. All first-generation astronauts have been wiped out by a deadly virus, food supplies are running low and now a series of mysterious deaths is threatening the future of the ship’s young crew. Cast into the role of leader way before her time, Captain Lindley has some heavy responsibilities upon her shoulders. Can she navigate her way through the chaos, solve the ship’s deadly secrets and survive the dramas of deepest space? Clubhouse Invite: Join us aboard our bookish space station (aka The Clubhouse) for an out-of-this-world online chat with our special guest author Kayla Olson. Unashamedly Bookish Calendar by Book Box Club: Forget Rule the Stars, with our exclusive Book Box Club 2019 calendar, you’ll be able to rule the universe! Featuring original artwork from the winners of our illustration competition, our calendar celebrates favourite books and what it means to be unashamedly bookish! Stand by tomorrow when we will be introducing you to all of them here on the blog. Red Rising Pencil by Book Box Club: Take inspiration from Darrow & Co and plot your path out of cosmic chaos with our Red Rising themed rainbow pencil. Bookish Extras: Check out these awesome new reads coming soon from our friends at The Borough Press and Hot Key Books. We’d like to say a huge thank you to all of the talented crafters, illustrators and small businesses who helped us to make our Rule the Stars box out-of-this-world. We’d also like to thank our December members for your letting us share in your unboxing excitement! We have had so much fun going through your photos, blogs and videos this month and we really appreciate all your enthusiasm and excellent photography skills! Thank you to @davison.sophie, @aspiderpigsreadings, @anarchyinthelibrary, @zanderstruck_books and @j.a.z.mc for these beautiful unboxing photos! What was your favourite item this month? Have you finished reading This Splintered Silence yet? Who else couldn’t put it down? If you missed out on this box and you’d like to get your hands on some of the exclusive goodies inside, head over to our shop where you’ll find a few highlights from our December box available, plus lots of other past boxes, goodies and books! Plus, stay tuned for another blog tomorrow, where we’ll be introducing you to the artists who we featured in our Unashamedly Bookish Calendar for 2019.